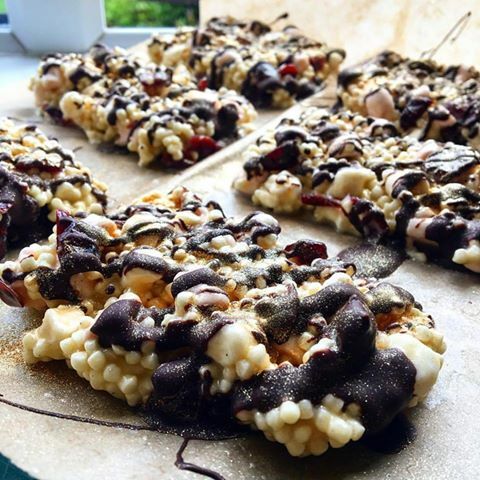 I've packed these protein crispy cakes full of protein crispies, dried cranberries, sugar free marshmallows, sugar free white & dark chocolate and plenty of dried cranberries so you'll never know they are a healthier, much lower sugar version of your favourite crispy cakes. 1Melt the coconut oil and white chocolate in a bowl over a pan of boiling water. 2Once melted remove from the heat and add the protein crispies, marshmallows & dried cranberries. Mix well. 3Tip the mixture into a well greased and lined baking tray and level out. 5While the mixture sets in the fridge melt the dark chocolate. 6Chop up into 6 equal bars and drizzle with dark chocolate. 7Chill in the fridge for at least another 30 minutes before serving.